The Island Heights Cultural and Heritage Association (IHCHA) is a non-profit corporation dedicated to promoting the rich historic, artistic, and architectural heritage of Island Heights. The Association offers assistance in the interpretation and care of historic properties and we actively collect local historic artifacts and ephemera to preserve for future generations. Monthly general membership meetings, interesting programs, shows and performances, publications, and commemorative ceremonies provide fun and enrichment for our members and guests. The IHCHA also offers programs on Island Heights cultural and history to interested organizations. The general member ship of the Island Heights Cultural and Heritage Association presently meets on the third Wednesday of each month at 7:30 p.m. at the Ocean County Artist Guild located at the corner of Ocean and Chestnut avenues. The association has very recently purchased a circa 1880 Carpenter Gothic cottage, which will be restored and furnished in the simple "summer at the shore" style, making it a living museum. 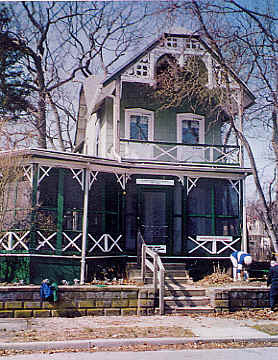 In the near future, our meetings will relocate to our new home, "The Cottage" at 105 Simpson Avenue in Island Heights. A special program and refreshments are usually part of out meeting and the public and guests are always welcome! We started in 1978 when a group of residents prompted by the spirit of civic pride during Island Heights' Centennial Celebration, founded the Island Heights Cultural and Heritage Association in order in perpetuate that by promoting greater interest in our rich historical background. Since that time, IHCHA has provided leadership, guidance and advice with respect to local preservation concerns. Over the years, we have sponsored numerous cultural, historic and social events. Island Heights is the most intact example of a planned Victorian religious resort in Ocean County and one of the best preserved in the state. Although late, the founding of Island Heights is reflective of the continuing Methodist revival of the late Victorian period. With the extension of the Pennsylvania Railroad’s Camden to Seaside Park Line to Island Heights in 1883, the middle class from central and western NJ and Philadelphia was offered easy access to this Christian family resort, and to oceanside towns throughout the county, giving birth to its tourism industry. The district’s riverfront, as compared to oceanside, out-of-the-way location and late 19th century construction boom left neither room nor cause for new development. There remains a dense concentration of well preserved, vernacular, Queen Anne houses displaying their original picturesque massing and detailing. The rare occurrence of intrusions allows Island Heights to retain the scale and ambience of a late 19th century resort town, and the remaining camp meeting grounds and camp houses reflect its religious origin. The primary styles of the district are of the vernacular Queen Anne, Shingle, and Bungalow. These styles were combined with Gothic Revival and Stick Style detailing for the ultimate in picturesque romanticism as so often characterized late 19th century New Jersey seaside architecture. Most structures have board and batten, natural shingled or clapboard walls. Many retain shingled front gables with sawn wooden screens, often with projecting gable peaks over a second level porch, almost always with a first level porch with turned posts, banisters, and ornamental brackets. Mitered cornices over double-hung sash windows, exposed rafter tails and structural elements, brick foundations (or none at all) are common elements. Also frequently used is cast stone for foundations, retaining walls, and sometimes whole buildings. This material was produced locally by the Parker Cement Works. The Island Heights Historic District is a highly intact array of primarily residential buildings, with the majority of its 375 structures built within a quarter century of its founding of a Methodist camp meeting resort in 1878. Intrusions are few, and the scale and pace of the district are decidedly human, rather than industrial or automotive. Such intrusions as exist must be so classified on the basis of their age and style, rather than massing; the district is overwhelmingly a 1 1/2 - 2 1/2 story, wood framed town. If you would like to be a member click the link at the top left that says membership.